Well, and here is the fun part, it can mean whatever you want it to. It could be putting one out-of-place item away, tackling a tiny chore or doing one thing outside the normal household routine every day. This is a completely customizable tip, depending on your mood. In the mood to clean? 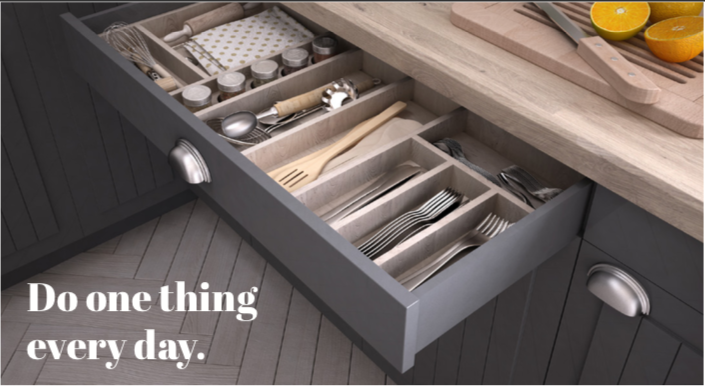 Do one thing every day, organize a drawer or clean one cabinet that has not been cleaned in a year. Not only will you feel more productive but you’ll notice a habit forming and a better quality of life.